The time I spent reading this book was agonizing, but only because it was undoubtedly one of the best history books I have ever read. I started reading it the night before my first day at a new job, so for the next weeks I wasn't able to bury myself in it with all the obsessive fervor that I normally would have. I found myself thinking about it all the time, carrying it with me everywhere I went in case I had a few stolen moments to read, and suffering to try and ignore it during work hours. I gushed about it openly, even to people who had no interest in it and who looked at me funny when I tried to explain Miranda Carter's fascinating observations about the changing nature of monarchy at the turn of the 20th century. George, Nicholas and Wilhelm is absolutely stellar. It is inspiring and inspired, and I have officially added Miranda Carter to my (mental) list of favorite authors. This history revolves around King George V of England (although his father, Edward VII, and grandmother, Queen Victoria, play huge roles as well), Tsar Nicholas II of Russia, and Kaiser Wilhelm of Germany, both their personal stories and the political roles each one played in Europe as it was drawn irrevocably into the First World War. Their stories are told by drawing on an incredible number of sources, primarily their own writings and letters, offering rare insight into their personalities and thoughts. But Carter is critical of them as well, looking them from the eyes of others, and so manages to create well-rounded and objective portrayals of each man as a whole. I don't believe I have ever read a book that so beautifully intertwines personal and political histories, and Carter's eloquent yet simple prose makes each sentence a joy to read. 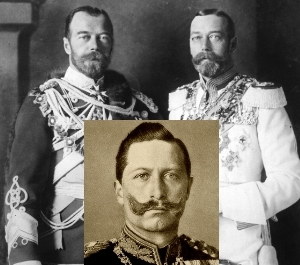 Tsar Nicholas II (left), King George V (right), and Kaiser Wilhelm II (center bottom). What makes this book so unique is that it is not a history of World War I, it is arguably the first comprehensive history of the decades leading up to the war. As children we are taught in school that World War I started because Archduke Franz Ferdinand, the heir to the Austro-Hungarian throne, was assassinated in Sarajevo (on Henry VIII's birthday, in case you wanted to know!). After reading Carter's book I see this as grossly over-simplified, like how an adult might try to explain physics to a two-year old. There was so much else going on beneath the surface, and George, Nicholas and Wilhelm shows that the road to WWI really began DECADES before 1914. It is a complex and enthralling history of dynastic relations and dysfunctional royal families, of misguided and competing colonial interests, of the emerging dominance of the media and popular opinion leading to the weakening of royal power, and of tensions between England, Germany, and Russia that deepened and spread for 30 years before war broke out. Carter explains these politics masterfully, it really gave me a whole new perspective on the war and a much more profound understanding of how and why it broke out in 1914. For me, of course, the most enjoyable parts of this book were the personal histories of George, Nicholas, and Wilhelm. These were some seriously messed up guys. Overall the book spent the most time discussing Wilhelm, and not without good reason. For all that he was villainized and turned into a monster by the Allied Forces during WWI, the real Wilhelm was probably one of the strangest and most peculiarly tragic historical figures I have come across. As a teenager he wrote disturbingly sexual letters to his mother. As an adult he obsessed over getting approval and recognition from his grandmother, Queen Victoria of England, and he often had to nurse his poor little hurt feelings when she rebuffed him or didn't invite him to her birthday parties. When Queen Victoria died he held her corpse in his arms for two and a half hours without moving. He slapped the King of Bulgaria on the bottom and then spread rumors that he was a hermaphrodite. He forced his wife to take diet pills to stay thin and made her wear outfits that he designed himself. He legitimately made stuff up to justify his political actions, like announcing repeatedly that George or Nicholas had promised him something important. But of course they heard through the grapevine and furiously denied promising him anything of the sort. Wilhelm also loved archaeology and "excavated" several Roman forts by himself (the archaeologist in me cried a little when I read that), and he was addicted to chopping down trees. Seriously, you can't make stuff like this up. One night I fell asleep while reading, and I had a dream that Wilhelm delegated all of his diplomatic duties to a hand puppet. The sad part is that after reading so much about him, this really didn't seem that bizarre or unrealistic, and it took me half an hour after waking up to realize that it had been a dream. All three of these monarchs talked behind each other's back and then told on each other, making secret alliances with one against the other and then shifting alliances. We might as well have had high school girls leading Europe. But despite their eccentricities, Carter portrays George, Nicholas, and Wilhelm as people. They had faults, to be sure, but these were human people who did not want war and bloodshed, who agonized over the part they played in the war, and who nevertheless contributed to starting the war. The real beauty of this book, and Miranda Carter's triumph, is that it is simple and unadorned yet extremely powerful. She writes of the history itself, but somehow the book rises above the history and makes the reader think about the big picture of the changing world in the 20th century and connect to the larger context of all that came before and all that was yet to come. 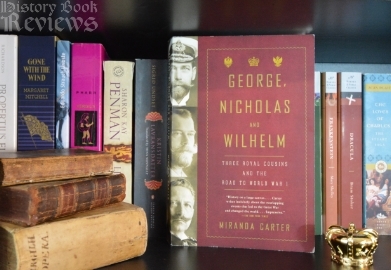 George, Nicholas and Wilhelm is simply magnificent, and I would encourage anyone and everyone to read it immediately if not sooner.